1. Preheat the oven to 220˚C, gas mark 7. Cook the new potatoes in boiling water for 20 minutes. 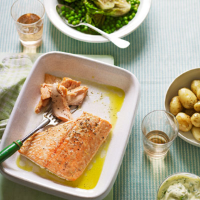 Place the salmon fillets in a roasting dish, then drizzle over the olive oil and the juice of ½ lemon. Season and bake for 15 minutes. 2. Meanwhile, heat the butter until foaming in a large pan with a tightly fitting lid. Add the salad onions and cook for 2 minutes, then stir in the little gems and, after 4 minutes, add the peas and stock. Cover with a lid and cook for 5 minutes. 3. Mix the crème fraîche, watercress, tarragon, horseradish, mustard and remaining lemon juice in a bowl. 4. Serve the salmon with the new potatoes, braised veg and watercress crème fraîche.